This little lady is so cute. I can't figure out how to identify her. Her material is some type of composite with a matte finish. Her face and lips are painted. Her arms and legs are jointed. She has unusual pins in the back of her hair which is braided like a crown. She is only 6.5" tall. 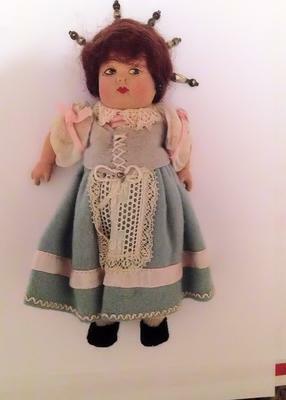 I got her from a doll collector's estate sale and was told it was antique.